Apple didn't have much difficulty convincing people they needed to upgrade to the iPhone 4S. But the new phone's biggest selling point, the voice-activated Siri assistant, has apparently already succumbed to the pressure of being at everyone's beck and call. 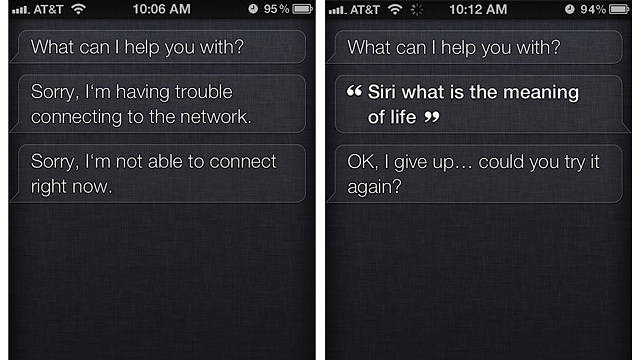 Over at the Cult of Mac, David W. Martin didn't get around to really testing out Siri until this morning. And when he did, it seems like the backend servers that keep her responding and answering questions were already a bit strained. His first query resulted in a polite, but upsetting, "Sorry, I'm having trouble connected to the network" response. Followed by a "Sorry, I'm not able to connect right now" confirming that Apple's servers are having a hard time keeping up with the initial demand. As Siri's knowledge, wisdom and voice recognition capabilities rely on a connection to those servers, we're hoping Apple is already on top of this because as more iPhone 4Ss get into more hands, the demand on her is only going to increase.